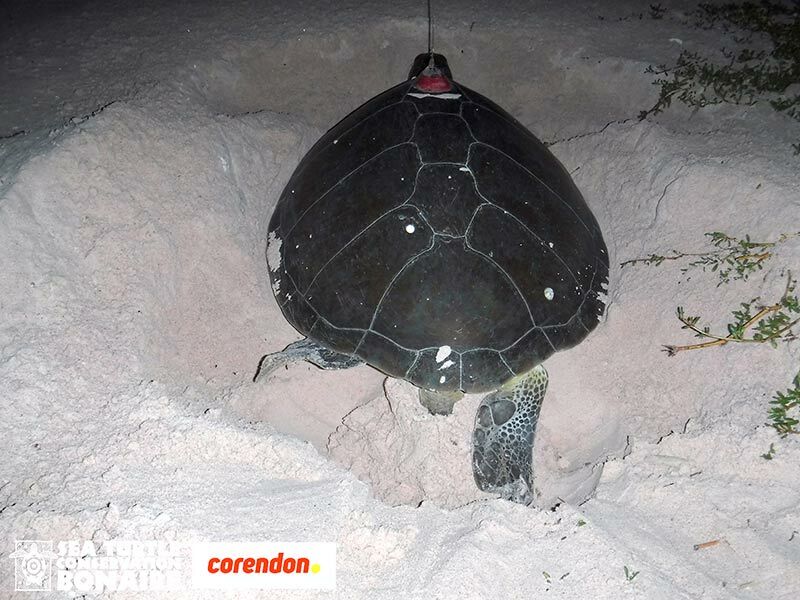 It appears that humans are not the only ones to pine for Bonaire when away…..recently we reported on Bonni, a green sea turtle, which laid her third (and supposed-to-be-final) nest on Bonaire. 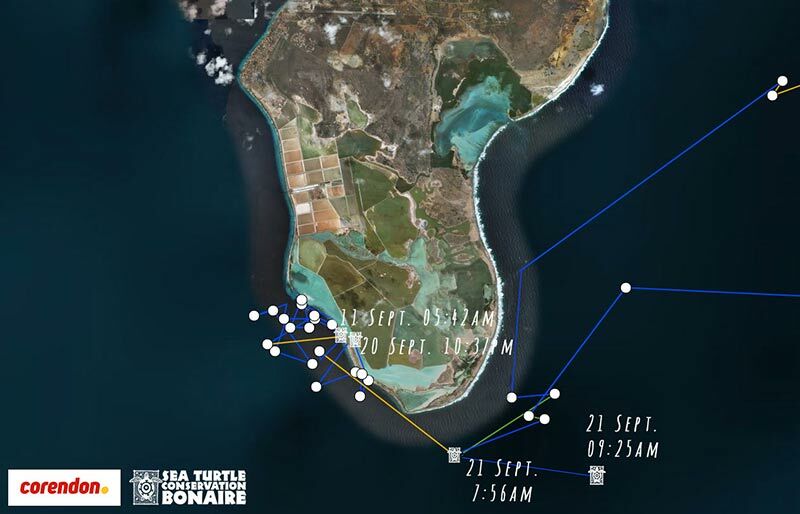 On September 10, 2018, Bonni was outfitted with a satellite tracking device just before she went to sea and it was expected that she would set her compass to her home feeding grounds, sending location transmissions each time she rose to the surface to breathe, and providing Sea Turtle Conservation Bonaire (STCB) with important data on the migration of Bonaire’s sea turtles. Bonni’s location four days later–September 14, 2018. Signals from the satellite transmitter showed that Bonni was cruising along the eastern part of the Las Aves Archipelago. Female sea turtles may live and feed in various waters in the region. However, when the inner clock signals the reproductive season, they migrate to the beach where they were first born. It is known that female sea turtles don’t eat, or eat scarcely while migrating from their feeding grounds to their nesting beach and commonly not at all once the laying has started. This is in order to save space for the eggs to develop in their bodies. Hence, the turtles lose the fat reserves that they built up prior to their reproductive migration. For this reason, if suitable habitat is found in their migration back home, sea turtles may stop to eat and regain some energy for their onward journey. It may be that Bonni was doing that in Las Aves, where mangroves and seagrass beds are part of the marine ecosystem providing a good feeding site for green turtles. Bonni’s location one week later–September 17, 2018. Although still in the Las Aves Archipelago on September 16, 2018, when STCB researchers checked on Bonni, they were surprised to see that Bonni was back in the open ocean and swimming back toward Bonaire. 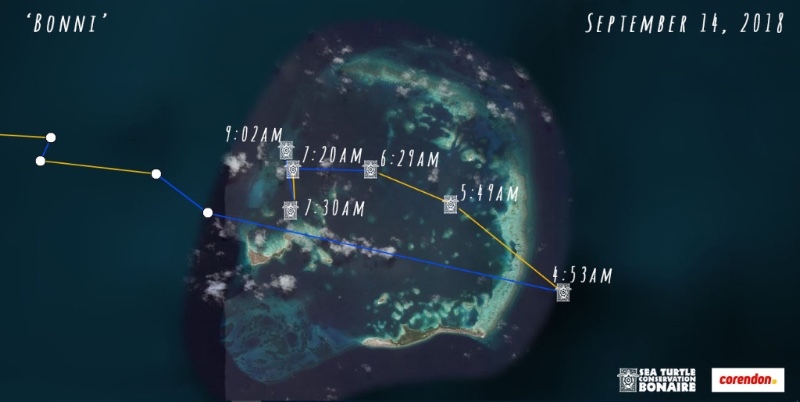 Over the years, STCB has tracked 26 sea turtles, and so far, of those, Bonni is the first post-breeding sea turtle that has done a loop like this after leaving Bonaire. This information supports the need for STCB’s ongoing satellite tracking program, as there is not a “‘one fits all” formula. Each tracking experience enhances the knowledge about migration patterns and thus provides a better understanding of how to best protect sea turtles within the Caribbean region. Bonni’s migration behavior does pose several questions. For example, is it common for green turtles to travel this far during their inter-nesting periods? And, will Bonni return to Bonaire to lay one or more nests or is she merely passing by to continue north? Or is it possible that Bonni lives on Bonaire, even though Bonaire’s habitat is a developmental habitat and not a feeding ground for adult turtles? Read on! Bonni returns to Bonaire–September 19, 2018. Bonni has indeed returned to Bonaire! 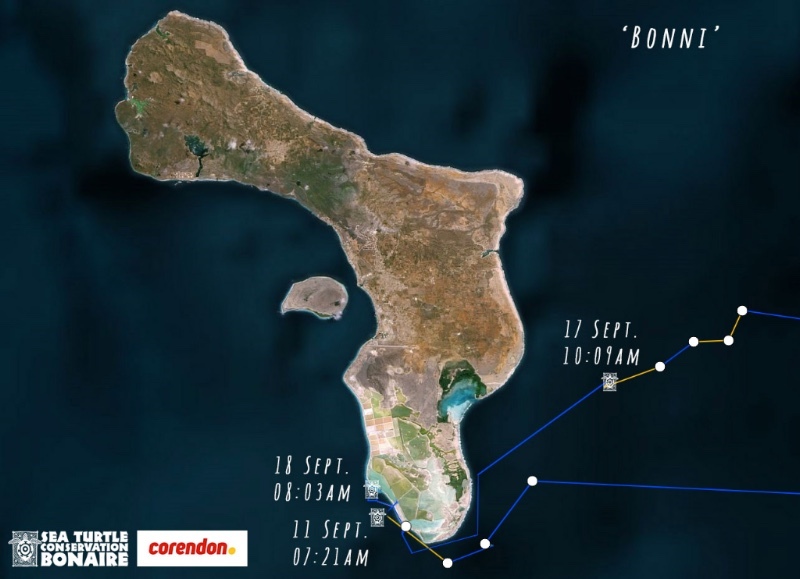 On the morning of September 19, 2018, Bonni was just north of where she left Bonaire after STCB deployed the transmitter in the night of Monday, September 10. If Bonni does indeed live in the Las Aves Archipelago, it is possible that she returned to her foraging ground during her inter-nesting period (that is the 12-14 day period between successive nests) and she will settle in Las Aves on completion of her breeding season. 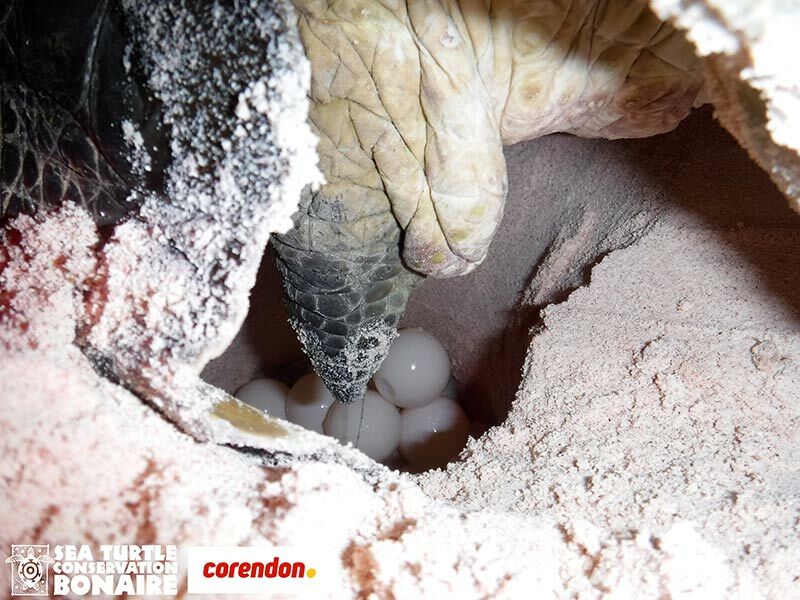 Bonni lays her fourth nest of the season on Bonaire–September 20, 2018. Bonni came ashore once again on the night of September 20, 2018, and, unbelievably, she laid her fourth nest of this season. After returning to the sea, Bonni started swimming east again, possibly towards the Las Aves Archipelago. Time will tell if Bonni is indeed going back to Las Aves, or if her journey will take her elsewhere? And, if she is making her way to Las Aves again, will she actually stay this time or will she return to Bonaire once more to surprise us with another nest? Stay tuned for more on this surprising story! About tracking Bonaire’s sea turtles. Sea Turtle Conservation Bonaire (STCB) began tracking adult sea turtles in 2003. Since that time, they have tracked 25 turtles, and Bonni is now the 26th. They have learned over the years that sea turtles born on Bonaire live as far as 2500 kilometers/1500 miles away and as close as Los Roques, only 175 kilometers/108 miles to the east. Where do Bonaire-born turtles go? 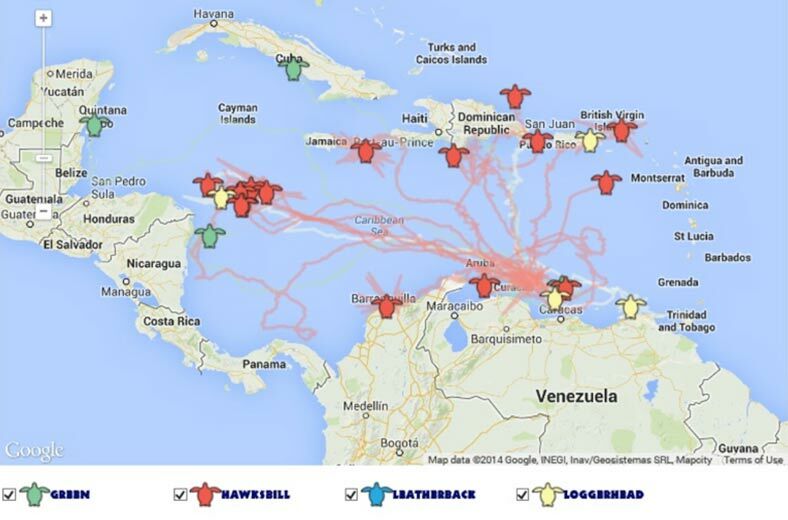 Since the tracking program began in 2003, STCB has tracked sea turtle migrations from Bonaire west to the Gulf of Mexico and to the coastal waters of Nicaragua, Honduras and Colombia; north to Cuba, Puerto Rico, the Dominican Republic, the Virgin Islands, and east to Isla de Margarita in Venezuela. These countries are “range states” of Bonaire’s breeding sea turtles; regions where our turtles spend portions of their lives. Turtles protected on Bonaire may continue to be protected, or they may become vulnerable when they migrate, depending upon the degree of protection afforded by their migration and destination range states. How is the tracking done? STCB attaches a small, non-intrusive satellite transmitter to a sea turtle’s carapace (shell). Every time the turtle surfaces to breathe, the transmitter sends data about the turtle’s location to NOAA satellites. The accuracy of the location data varies depending on the number of messages received from the transmitter, environmental conditions, and relative positions of the transmitter and the satellites. Each transmission is picked up by a receiver on the satellite and is then plotted onto a map. About Sea Turtle Conservation Bonaire. Sea Turtle Conservation Bonaire (STCB) is a non-governmental research and conservation organization that has been protecting sea turtles since 1991. Bonaire is their headquarters and home to three of the world’s six endangered or critically endangered species of marine turtles: the hawksbill, green, and loggerhead turtle. STCB is a member of the Wider Caribbean Sea Turtle Conservation Network (WIDECAST). STCB is very active in the community to help protect these endangered turtles. Visitors can learn more by arranging for a Turtle Nest Monitoring excursion, available during the turtle breeding season.